Is the Tibetan Mastiff right for you? Find your perfect match now! They might look imposing, but Tibetan Mastiffs are huge balls of love. Originally bred to protect villagers in the Himalayas, today this breed is still a respected guard dog, as well as a cherished canine companion. But the Tibetan Mastiff is probably never going to win any obedience contests — this pup has a mind of her own! Originally from Tibet, this large-sized and medium-energy breed can grow to between 75-160 pounds and lives an average of 12-15 years. 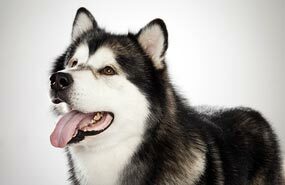 The breed is recognized by the American Kennel Club and classified as a member of the Working group. WHAT IS A TIBETAN MASTIFF'S PERSONALITY LIKE? Their territoriality makes them suspicious of new folks, so early, frequent socialization is important. Tibetan Mastiffs are protective of their family, both the two-legged and four-legged members. WHAT IS TIBETAN MASTIFF BEHAVIOR LIKE? Though reserved and laid-back, the Tibetan Mastiff is a moderately active dog once she's outside. That activity might include digging in your flower beds, so you'll want to keep an eye on her in the backyard and make sure her energy has a regular outlet. Plan for daily games or decent-length walks every day. Some are prone to nocturnal barking — possibly a leftover behavior from their centuries as village guardians. HOW EASY IS IT TO TRAIN A TIBETAN MASTIFF? Tibetan Mastiffs are both intelligent and deeply invested in getting their own way. Training this dog is a bit of a challenge. They do like routine, though, and can be motivated to repeat good behaviors with treats, play, and praise. You will get absolutely nowhere trying to bully this dog into obeying you. Socialize your pup early and often to discourage timidity or suspicion of new people and situations. This breed can be territorial and is not known for reliable recall, so reserve off-leash play for safe, well-fenced areas. And we mean well-fenced. Underground electronics don't often have much stopping power against this motivated 120-pound dog. 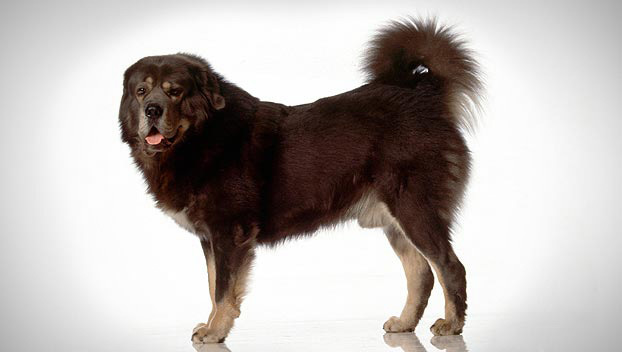 While Tibetan Mastiffs sometimes appear in American show rings, they're often a bit too independent-minded for organized dog sports like agility or obedience. HOW MUCH DO TIBETAN MASTIFFS SHED AND WHAT ARE THEIR GROOMING NEEDS? While Tibetan Mastiffs don't shed much for most of the year, they do blow coat annually. This means that for about a month every year, your home, clothes, and belongings will be covered with hairy little reminders of your beloved furry friend. Plan to brush their dense coats about once a week. WHAT HEALTH PROBLEMS DO TIBETAN MASTIFFS HAVE? As a breed, Tibetan Mastiffs are generally healthy. Some are vulnerable to thyroid disorders, seizures, and elbow or hip dysplasia. ARE TIBETAN MASTIFFS GOOD FOR PEOPLE WITH ALLERGIES? The American Kennel Club doesn't list Tibetan Mastiffs among its breeds recommended for allergy sufferers. Remember that no breed is 100% hypoallergenic, and any breed can aggravate allergies. You can reduce your furry friend's impact on your allergies with frequent baths and brushings to reduce loose hairs and aggravating proteins in your pet's dander. Use a damp cloth to wipe off your dog after you've been playing outside. Smaller dogs have less surface area, and so produce comparatively less dander than larger breeds — definitely something to keep in mind with a dog as extra large as a Tibetan Mastiff! Remember that no breed is 100% hypoallergenic, and any breed can aggravate allergies. WHAT IS A TIBETAN MASTIFF'S BEST DAY? Tibetan Mastiffs want to spend time with their people — preferably including “their” kids, preferably outside, no matter what the weather is doing. They'll particularly enjoy opportunities to lead your family on a hike, and will be inclined to protect you from anything that might cross your path! SHOULD I ADOPT A TIBETAN MASTIFF? As you might expect of a Himalayan mountain dog, the Tibetan Mastiff is very comfortable in cold temperatures, but tends to wilt in the heat. This is probably not the best breed for an inexperienced dog parent — these gentle giants are very independent-minded and can be challenging to train. But if you have the space to let her run and play, you won't find a better dog to watch over you. Have you decided that a Tibetan Mastiff is the perfect dog for you? Why not be your new best friend's hero and adopt a rescue! Be sure to check out our article on what to expect when you're adopting a dog or cat.